Now that you are ready to take on your new role as a Tech-Savvy CFO, don’t be surprised when you find yourself growing in other roles in your company. As you develop new strategies for your finance department, you will find increased interaction with other departments as you thirst for more data. You will find other departments reaching out to you in their thirst for more information. You will find stakeholders relying on your data to make future-driven decisions. In other words, you will become a change agent in your company. How do you break out of your comfort zone, hiding amidst the numbers, to embrace this aspect of your position as a tech-savvy CFO? Now that you’ve embraced change, be ready for constant change. Your new role is forward-looking, not only from the numbers standpoint but from the technology standpoint. As you re-create your finance department, surround yourself with staff and partners who are willing to look forward, embrace new technologies, ensure that you keep your advantage by staying ahead of the technological curve. Prudence has long been the way of the CFO, but increasingly boldness will join that virtue in your business as you take your finance department and your business into what can seem to be an unknown future. Silos must come down for businesses to succeed in the future. As a change agent, you can ensure that happens by reaching across the departments within your company to obtain your best data, to teach others why that data is important and how they can use it in their branch, and to project where your company’s future growth lies. Fostering collaboration within an organization is absolutely vital to meeting customers’ growing expectations. Change cannot happen in one department without buy-in from across the organization. Each company’s best talent must come together to develop a strategy of change to meet customers’ demands. As a tech-savvy CFO, you are in the perfect position to serve as a change agent to drive that collaboration. You need to gather data from sales, from marketing, from production. You have the ability to recognize the individuals in those departments who also can serve as change agents to create a united company, one moving forward with customers’ needs as their highest priority. And you have the ear of the stakeholders and the resources and information to encourage them toward this course of change. What gives you this authority to become the change agent within your company is the visibility you will create with your new data compilation. With your automated accounting and best-of-breed analytics, you’ll be able to guide your stakeholders and fellow change agents with a view of your business that sees clearly backward and forward. You will have data, gathered in a single source, that can point out where your company is succeeding and where it might be slipping, with up-to-the-minute data. You’ll no longer be relying on out-of-date spreadsheets that may or may not contain accurate information about each project and each aspect of your company’s business. Technology will give you the visibility to know where success lies and where failure looms before it’s too late. With data-driven information, you will create a map to success before your competitors can learn they have taken a wrong turn. This is your opportunity to gain the advantage as a tech-savvy CFO. 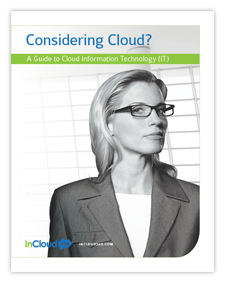 Learn more about the advantages of taking on a role as a change agent through the white paper, “Are You Ready to be a Tech-Savvy CFO?” presented by Intaact and InCloud360. Contact us when you are ready to sign on a partner who can lead you on that journey.